TWO WINNERS – Mystery Box Giveaway!!! LOVE your FACEBOOK page… there is ALWAYS something I Learn that I didn’t know! Great to share the information with others as well! Thanks for using the USPS flat rate shipping Boxes too! I contacted Renee and Miss Zoe via e-mail. Renee and Zoe, please e-mail me at gretchen (at) veggiegrettie (dot) com with your mailing address and I will get the boxes out to you ASAP. Please respond within 3 days or I will be forced to choose an alternate winner. Congratulations and thank you for being a Veggie Grettie reader! Remember…I can not guarantee that all of the samples are vegan or gluten free…please read the labels. Remember the mystery giveaway I ran last year? Well…this year I will be choosing TWO winners!!! As you all know, I have WAY too many samples from the Natural Products Expo West to consume myself and I want to make sure nothing goes to waste, so I am sharing the loot. I completely filled TWO Large USPS Flat Rate Boxes with samples…one for each lucky winner. Note that not all of the products are gluten-free or vegan (thought many many are) so, please make sure you check the ingredients. 1. Become an e-mail subscriber (if you aren’t already) by entering your e-mail address in the box on the upper right hand corner of this page under the header image. 2. ”Like” Veggie Grettie on Facebook (click HERE). 3. Leave me a comment below telling me that you have become (or already are) an e-mail subscriber, and that you have “liked” Veggie Grettie on Facebook. I have been making this well-loved tofu dish for years, however due to my hypothyroid issues (click HERE for more details) I have avoided soy for a while now. If it weren’t for my thyroid issues, I would include tofu, tempeh, and edamame in my diet…I don’t think there is any harm (actually there are benefits) to including unprocessed soy items in your diet rotation. Having said that, I would avoid the processed soy foods that are über plentiful in the market today. The creator of the EZ Tofu Press ($26.99) recently contacted me and offered to send me a free sample of his product to test and review. I own the TofuXpress which retails for $39.95 now, but I paid nearly $50 for it when I purchased it…ouch!!! I was curious to see how the two tofu presses compared. While I like the fact that the TofuXpress I already own and use is a completely self-contained unit, it takes a hours for the tofu to drain completely which is a drag and means that you absolutely have to plan ahead. The new EZ Tofu Press seriously drained completely within 7 minutes! I put the tofu in the press, prepared the rest of the ingredients for my meal, and the tofu was ready to go. Major bonus. The EZ Tofu Press was also easy to clean…all I needed to do was rinse it off. 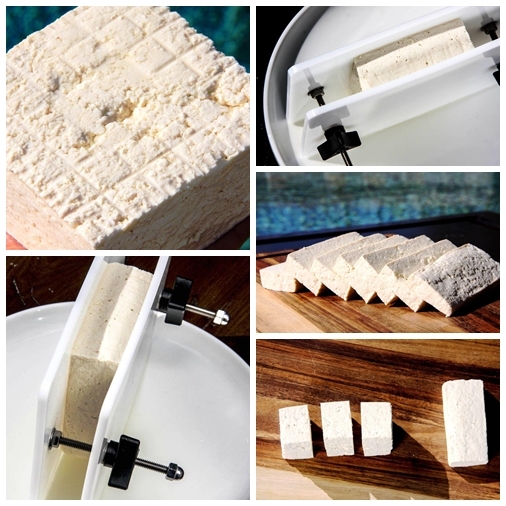 Make sure you go to the bottom of the post and learn how you can enter to win your very own EZ Tofu Press. The traditional way to prepare this tofu dish is to fry it in a bit of oil. I thought I would try “frying” the tofu in a dry pan (I used my ceramic pan) and I was happy with the results. The sauce I always served this dish with is Black Bean Garlic Sauce, which is NOT gluten-free. If you would like to serve the tofu with a gluten-free sauce, SAN J has some really tasty ones (their Szechuan sauce rocks). Keep in mind that you want the sauce to be a bit overflavored, oversalty, etc. 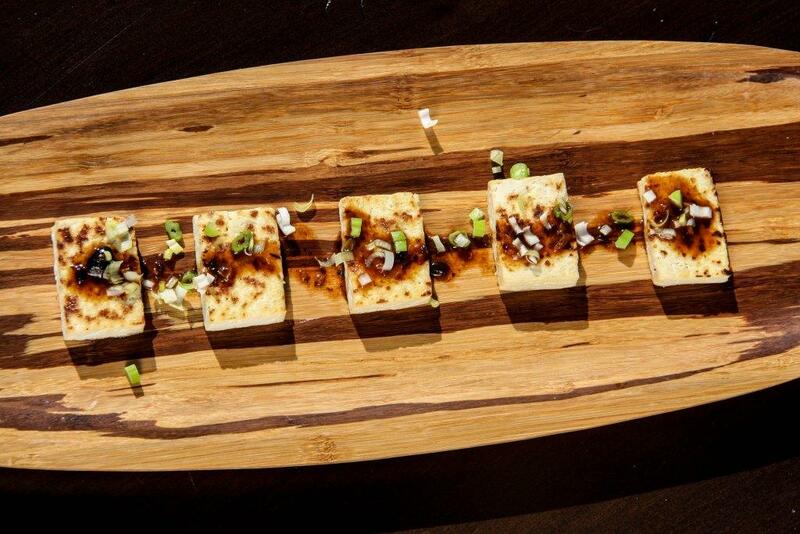 since you are serving it with absolutely plain tofu. 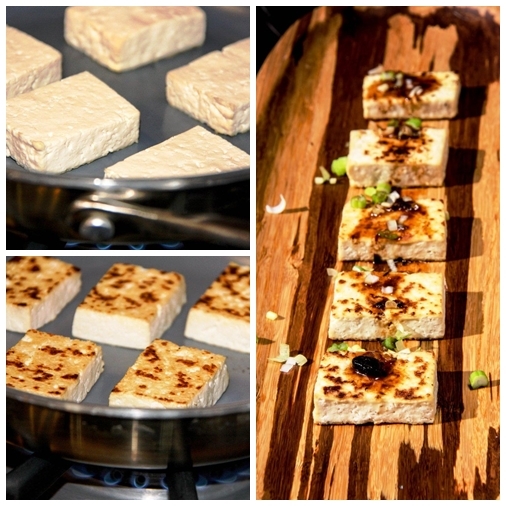 Slice the tofu into 1/4″ thick slices. Now slice the slices into thirds (See image above). If using black bean garlic sauce, mix the sauce, the ginger, chilies if using, and 1-2 Tbs. water (depending on your personal taste) to a bowl and mix to incorporate. Heat your pan on HI. Place the tofu slices in the pan and dry-fry them for 2-3 minutes per side until browned. If you insist on using oil, use it sparingly. Serve immediately topped with a drizzle of sauce and garnished with the minced green onions. I emailed my best friend!! HAPPY HERBIVORE ABROAD – WINNER!!! If you are “ammauceri,” please e-mail your mailing address to gretchen (at) veggiegrettie (dot) com and I will have the publisher send the book to you ASAP. Happy New Year and a big thank you to all who entered. It has been a loooooooooooooong time since I hosted a giveaway…I was waiting for something really worthy of a giveaway and I know you will find this “giveaway worthy!” For those of you unfamiliar, Lindsay Nixon is a low-fat vegan recipe developing goddess. Her recipes are simple, healthy, and full of flavor. “In the last 10 years, Happy Herbivore chef Lindsay S. Nixon has lived in eight states, visited 46, spent a year as an expat on a Caribbean island, and traveled to more than 35 places abroad. As a celebration of Nixon’s jet-setter lifestyle, Happy Herbivore Abroad combines traditional comfort foods from home with international inspiration and stories of her adventures. I jumped at the chance to interview Lindsay and eagerly accepted her offer to host a giveaway of her latest cookbook, Happy Herbivore Abroad (Giveaway details follow the interview). GRETCHEN – In my experience, people always like to know what led someone to a plant-based lifestyle. When did you become plant-based and why? LINDSAY NIXON – I was a vegetarian for most of my life, but lapsed back to meat-eating in my late teens due to family pressure and peer pressure. A serious health scare in my early 20’s brought me back to a vegetarian diet and about a year later I adopted a totally plant-based (vegan) diet. I was motivated mainly for health reasons, but I also care about the environment and am moved by the plight of farm animals. G – I really enjoyed reading your post, “I’m (Still) Not a Vegan Anymore!” People react so strongly to the word “vegan” and like you, I feel funny using that word to label myself. Did you expect the original post to get as much attention as it did? LN – I had no idea it would garner so much attention or that I’d still be talking about it a year later. I remember sitting at my desk, staring at the computer screen in total shock. My inbox was pinging every 3 minutes. I am sure each of your books has a very special place in your heart…Do you have a favorite? LN – They’re all special and unique in their own way. All of them had their challenges, and miracles. I love them equally. I imagine asking an author to pick their favorite book would be like asking a parent to pick their favorite child. What do you typically eat in the span of a day and are you a snacker? LN – I used to be a snacker, until I read Mindless Eating. That book really changed my eating habits. My daily food intake is varied — since my schedule is always changing. What is your favorite plant-based indulgence? In your wildest dreams, what would your life look like in 5 years? LN – I hope to be retired in 5 years, living in Thailand or Indonesia. I’ll make it happen. Sign-up for Linday’s Newsletter (I am a subscriber!) by clicking HERE and entering your e-mail address in the bottom right corner of the page. LEAVE A COMMENT ON THIS POST FOR EACH TASK COMPLETED (That’s up to 4 comments…4 entries)!!! LEYLA is the winner of the Green Kid Crafts giveaway. I am so excited to offer this wonderful giveaway courtesy of Green Kid Crafts (Click HERE for my product review). Green Kid Crafts will be giving away 1 PLANET-FRIENDLY CRAFT BOX to one lucky winner. 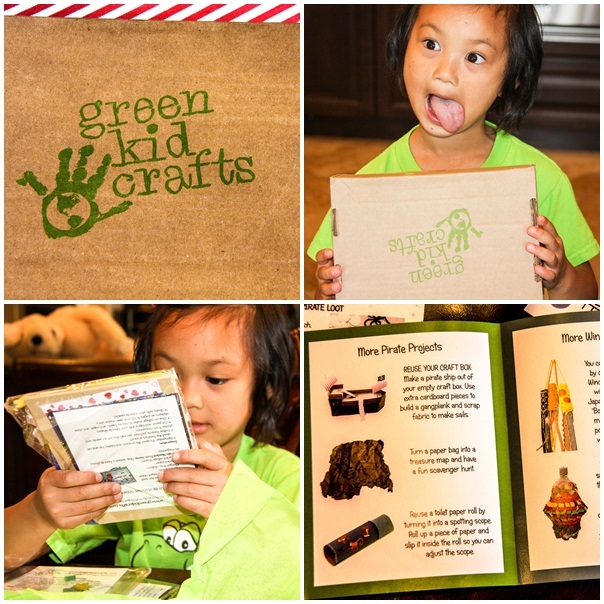 Founded in 2010, green kid crafts is the original craft subscription company. With Green Kid Crafts, parents and kids can enjoy planet-friendly (they offset 100% of the CO2 they generate), monthly projects that spark creativity and cultivate respect and love for the environment. All materials are included in the package, making it one-stop shopping for child engagement. Monthly memberships are available for $19.95. Gift subscriptions are also available for three, six, or twelve months. Check them out at http://www.greenkidcrafts.com . Use code: SUMMER and get $10 off your first craft box!!! Visit the Green Kid Crafts website (click HERE) and let them know what craft project you would like to see Green Kid Crafts create next by e-mailing your suggestions to penny@greenkidcrafts.com (REQUIRED TO ENTER GIVEAWAY). Leave a comment below stating that you have done this. “Like” Green Kid Crafts on Facebook (click HERE)…this will gain you and EXTRA entry. Leave a comment below stating you have completed this. “Like” Veggie Grettie on Facebook (click HERE)…this will gain you and EXTRA entry. Leave a comment below stating you have completed this. Subscribe to Veggie Grettie’s E-mail Subscription (upper right corner of homepage below the Header Photo)…this will gain you and EXTRA entry. Leave a comment below stating you have completed this. This giveaway is limited to residents of the United States. The giveaway will run through midnight PST, Tuesday AUGUST 19th. A big thank you to all who entered this fun giveaway and a HUGE thank you to the wonderful Spork Sisters. GIVEAWAY – Spork Sister’s 6 Month Spork Online Subscription!!! You are super lucky! 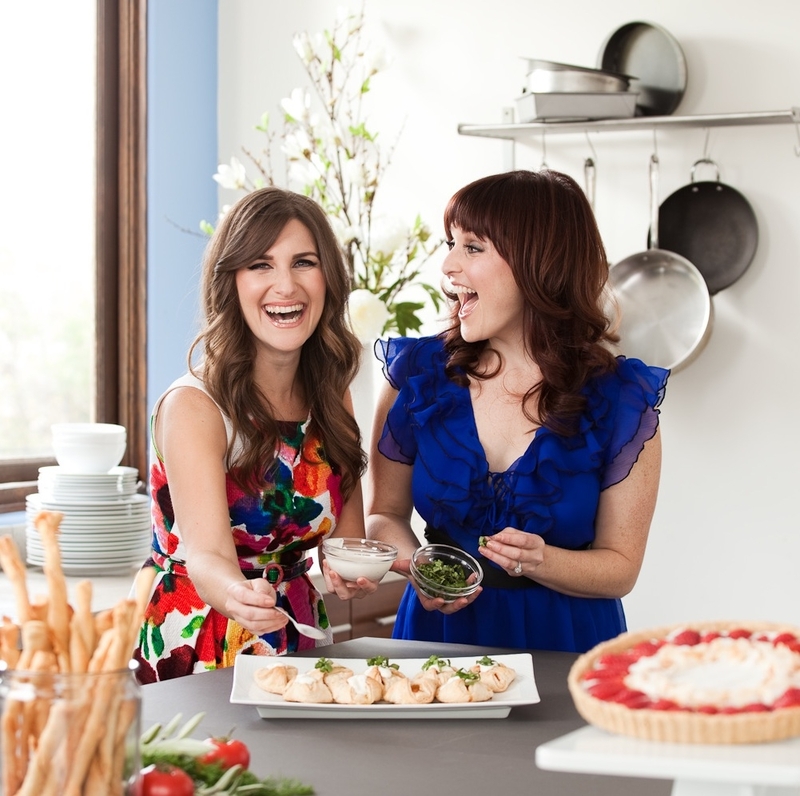 The lovely Spork Sisters are providing one 6 month membership to Spork Online as a giveaway!!! Say what??? I know. Crazy. The best news is that this giveaway is open to EVERYONE!!! So often we need to limit the giveaways to the US and Canada and since this giveaway is online-based it is open to everyone worldwide…yay!!! I have worked with quite a few people in the vegan world now and I must say that these sisters are top-notch. So friendly, so knowledgeable, so approachable. I know you will love their teaching style. While watching their cooking classes online you forget that you are at your computer and feel as though you have been transported to their kitchen. I can’t wait to find out who wins! You will receive ONE ENTRY for EACH task completed. You MUST leave a SEPARATE COMMENT BELOW FOR EACH of the tasks you complete. The contest will run through 6/21/12 midnight PST. The winner will be chosen randomly. Good luck! Please contact me via gretchen (at) veggiegrettie (dot) com with your mailing address, style choice (click HERE to decide), and size. I will then contact Musewear and they will send the product to you directly.